How did the three Senate classes end up this way? The Crystal Ball’s Kyle Kondik recently published a piece in Politico Magazine on 10 maps that explain the 2014 election. We recently highlighted one of those maps, which focused on the rather unrepresentative nature of the Senate Class 2 map that is up this November. Its 33 states contain slightly more than half (51.8%) of the nation’s entire population. However, Class 1 (the 2012 class) also features 33 states, but those states host three-quarters (75.2%) of the population, and Class 3, with 34 states and an upcoming election in 2016, is similar to Class 1, with 72.6% of the population. So how did we get to the point where two Senate classes are made up of states comprising roughly three-quarters of the states’ population while the other barely represents a majority? The answer is random chance, more or less. As detailed on the U.S. Senate’s FAQ page, when the first Senate met in 1789, members were divided into three groups (with no state having two senators in any group) and then lots were drawn to determine which would make up the three classes. Therefore, by pure chance, some senators in the first Congress were saddled with mere two-year terms while some of their colleagues received an initial four-year or six-year term. The number of states has nearly quadrupled since the nation’s founding, necessitating an expansion of Congress’ upper chamber. When a new state joins, the first priority is balancing the classes if they are uneven (as they are today, with two classes of 33 senators and one of 34). Once that consideration is taken into account, the new state’s two senators toss a coin to determine the order of drawing lots to see which class each joins and then proceed to pick. Just take the most recent expansion of the Senate in 1959. Prior to Alaska and Hawaii becoming states, the Senate had 96 members, resulting in three classes of 32 senators each. Because all the classes were equal, the senators from the next state to join would have a chance of drawing any of the three classes. Alaska, the 49th state, was up first. Sens. Bob Bartlett (D) and Ernest Gruening (D) were elected on Nov. 25, 1958, to take the Last Frontier’s two seats in the Senate. Upon the official admission of Alaska as a state on Jan. 3, 1959, the same day the 86th Congress first met, Gruening drew a four-year term (Class 2) while Bartlett drew a two-year term (Class 3), leaving Class 1 as the smallest of the three groups. About eight months later, Hawaii became a state (on Aug. 21, 1959). Because Class 1 needed to gain a senator for balance, one of the Aloha State’s new senators was guaranteed to end up there. Two cards were placed in a mahogany box, one blank and one calling for a Class 1 term. Hawaii’s duo, Sens. Hiram Fong (R) and Oren Long (D), had a coin toss to determine who would draw first. Long won the toss but drew the blank card, leaving Fong the Class 1 entry and a nearly six-year term (ending Jan. 3, 1965). Then Long drew from a second box containing cards calling for a Class 2 and a Class 3 term, from which he selected Class 3. This is why Class 3 is the largest class today, with 34 senators compared to 33 in the other two. Thus, by luck of the draw, the Senate classes exist as they do today. Below is a graph showing how each class’ percentage of the overall state population has changed over time at each decennial census. Note: Percentages determined by the population of states that were included in the congressional reapportionment process after each decennial census divided by the overall state-based population (i.e. the total population excluding territories or Washington, D.C.). 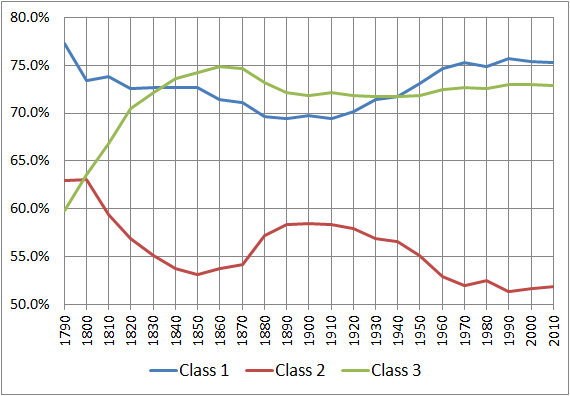 As the chart shows, Class 2’s percentage of the overall state population has been lower than its two counterparts since the 1800 census. Class 2’s position became entrenched in part because of the assignment of senators from big states such as Ohio and California. The Buckeye State achieved statehood in 1803 and wound up with senators in Classes 1 and 3; by 1820 it had the fifth-largest population of any state. Thirty years later, California became a state when the three classes were already perfectly divided at 20 per group. The Golden State’s two senators also wound up in Classes 1 and 3, with long-term consequences for population imbalance among the classes (California is of course the most populous state today). The next state to join the union after California was Minnesota (with senators drawn into Classes 1 and 2); switch California’s Class 3 seat with Minnesota’s Class 2 seat and today Class 2 would represent 62.2% of the total state population instead of just 51.8% (Class 3 would fall to 62.5%). 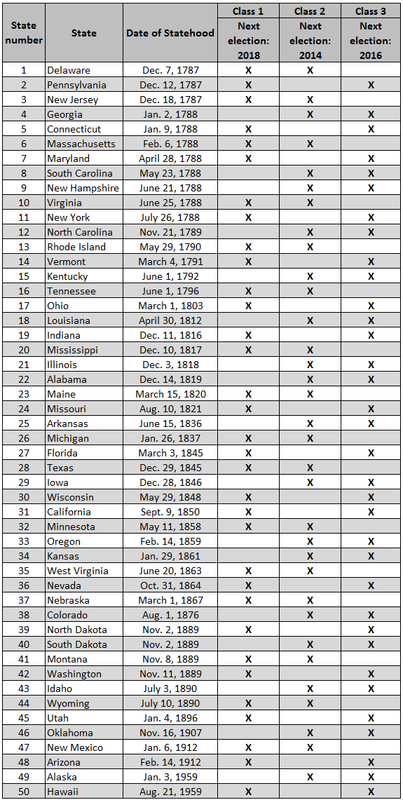 Below is a list of states by statehood date with their Senate classes. Note: For a PDF of this table, click here. Should the U.S. add a new state at some point in the future (possibly Puerto Rico, though many citizens in the nation’s capital continue to hope for D.C. statehood), there won’t be much drama on the Senate class selection front. Because Class 3 has one more senator than the other two classes, the 51st state’s two senators will be placed in Classes 1 and 2 to achieve parity. Timing and random chance created the population imbalance among the three Senate classes. Because the U.S. isn’t likely to add a new state any time soon, and because of the huge gap between Class 2 and the others, the disproportionate status quo is unlikely to equalize any time soon.